To complete each session watch the video presentation and complete the review questions. The review questions will be made available once you have watched the full video presentation. The review questions are in multiple-choice format and you will receive immediate feedback. 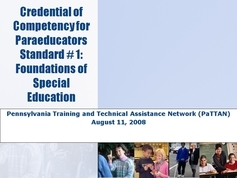 This session focuses on the knowledge areas of Standard #1: Foundations of Special Education. These knowledge areas are: 1K1 Purposes of programs for individuals with exceptional learning needs. 1K2 Basic educational terminology regarding students, programs, roles and instructional activities. This training will provide participants with information on these two knowledge areas and allow them to achieve these two areas on their Competency Checklist. This session focuses on Standard #2: Development and Characteristics of Learners. The knowledge area to be covered is: 2K1 Effects an exceptional condition(s) can have on an individual's life. 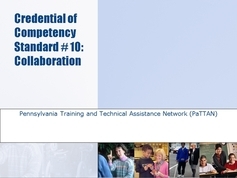 This training will provide participants with information on this knowledge area and allow them to achieve this standard on the Competency Checklist. This session focuses on the skill and knowledge areas of Standard #3: Individual Learning Differences. These areas are: 3K1.Rights and responsibilities of families and children as they relate to individual learning needs. 3K2.Indicators of abuse and neglect. 3S1. Demonstrate sensitivity to the diversity of individuals and families. This training will provide participants with information on the knowledge areas and allow them to achieve these areas on their Competency Checklist. Information will also be provided to allow participants to demonstrate S1 to supervisors. 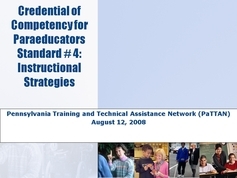 This session focuses on the skill and knowledge areas of Standard #4: Instructional Strategies. These areas are: 4K1.Basic instructional and remedial strategies and materials. 4K2.Basic technologies appropriate to individuals with exceptional learning needs. 4K3. How students learn reading. 4K4. How students learn mathematics. 4S1. Use strategies, equipment, materials, and technologies, as directed, to accomplish instructional objectives. 4S2. Assist in adapting instructional strategies and materials as directed. 4S3. Use strategies as directed to facilitate effective integration into various settings. 4S4. Use strategies that promote the learner’s independence as directed. 4S5. Use strategies as directed to increase the individual’s independence and confidence. This training will provide participants with information on the knowledge areas and allow them to achieve these areas on their Competency Checklist. Information will also be provided to allow participants to demonstrate S1, S2, S3, S4 and S5 to supervisors. This session focuses on the skill and knowledge areas of Standard #5: Learning Environments and Social Interactions. These areas are: 5K1. Demands of various learning environments. 5K2. Rules and procedural safeguards regarding the management of behaviors of individuals with exceptional learning needs. 5S1. Establish and maintain rapport with learners. 5S2. Use universal precautions and assist in maintaining a safe, healthy learning environment. 5S3. Use strategies for behavior management as directed. 5S4. Use strategies as directed, in a variety of settings, to assist in the development of social skills. This training will provide participants with information on the knowledge areas and allow them to achieve these areas on their Competency Checklist. Information will also be provided to allow participants to demonstrate S1, S2, S3, and S4 to supervisors. 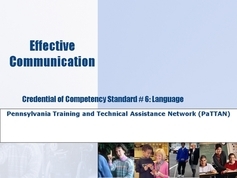 This session focuses on the knowledge area of Standard #6: Language. This area is K1: Characteristics of appropriate communication with stakeholders. This training will provide participants with information on this knowledge area and allow them to achieve this area on their Competency Checklist. 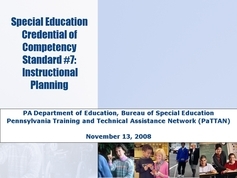 This session focuses on the skill areas of Standard #7: Instructional Planning. These areas are S1: Follow written plans, seeking clarification as needed and S2: Prepare and organize materials to support teaching and learning as directed. This training will provide participants with information on these skill areas that will allow them to demonstrate these skills to their supervisors. 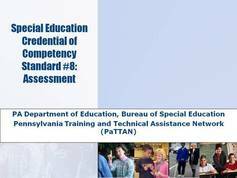 This session focuses on the skill and knowledge areas of Standard #8: Assessment. These areas are: K1. Rationale for assessment K2. Assessments in reading K3. Assessments in mathematics S1. Demonstrate basic collection techniques as directed S2. Make and document objective collection techniques as directed This training will provide participants with information on the knowledge areas and allow them to achieve these areas on their Competency Checklist. Information will also be provided to allow participants to demonstrate S1 and S2 to supervisors. 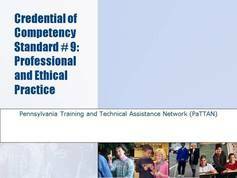 This session focuses on the skill and knowledge areas of Standard #9: Professional and Ethical Practice. These areas are: K1. Ethical practices for confidential communication about individuals with exceptional learning needs. K2 Personal, cultural biases and differences that affect one's ability to work with others. S1. Perform responsibilities as directed in a manner consistent with laws and policies. S2. Follow instructions of the professional. S3. Demonstrate problem-solving, flexible thinking, conflict management techniques, and analysis of personal strengths and preferences. S4 Act as a role model for individuals with exceptional learning needs. S5. Demonstrate commitment to assisting learners in achieving their highest potential. S6. Demonstrate the ability to separate personal issues from one's responsibilities as a paraeducator. S7. Maintain a high level of competence and integrity. S8. Exercise objective and prudent judgment. S9. Demonstrate proficiency in academic skills, including oral and written communication. S10. Engage in activities to increase one's knowledge and skills. S12. Accept and use constructive feedback. S13. Demonstrate ethical practices as guided by the CEC Code of Ethics and other standards and policies. Taking this course will provide participants with information on the knowledge areas and allow them to achieve these areas on their Competency Checklist. Information will also be provided to allow participants to demonstrate S1, S2, S3, S4, S5, S6, S7, S8, S9, S10, S11, S12, and S13 to supervisors. This session focuses on the skill and knowledge areas of Standard #10: Collaboration. These areas are: K1. Common concerns of families of individuals with exceptional learning needs. K2. Roles of stakeholders in planning an individualized program. S1. Assist in collecting and providing objective, accurate information to professionals. S2 Collaborate with stakeholders as directed. S3. Foster respectful and beneficial relationships. S4. Participate as directed in conferences as members of the educational team. S5. Function in a manner that demonstrates a positive regard for the distinctions between roles and responsibilities of paraeducators and those of professionals. This training will provide participants with information on the knowledge areas, K1 and K2, and allow them to achieve these areas on their Competency Checklist. Information will also be provided to allow participants to demonstrate S1, S2, S3, S4, and S5 to supervisors.